Have you ever thought about what it’d be like to have a few extra fingers? Sang-won Leigh has, which is why he has developed programmable robotic joints that are worn around your wrist to instantly give you an extra pinky, a third thumb, or even another hand. 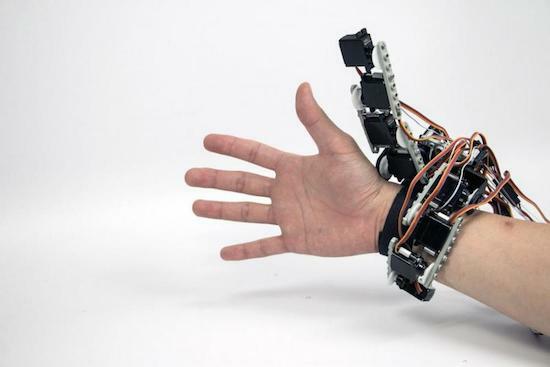 These cyborg-like devices, called Robotic Symbionts, consist of 11 motors that can detect brain signals sent to the forearm’s brachioradialis muscle and rearrange themselves to suit different tasks. Since these muscles aren’t used to move your human hand, anyone can learn to employ their Robotic Symbiont fairly quick. According to its paper, the motors are linked together using LEGO parts, each of them with a 180-degree motion range. Cables from each motor are connected to an Arduino. What’s neat is that the robotic joints are controlled independently from the wearer’s actual hand and can be configured for various use cases, such as a grip to hold things below the wrist, a palm to grab large objects, an extra thumb to flip a page of a book while holding it open, a support for note taking, or even a joystick for computer games. You can read all about the project here.